Noah’s Ark: Moral Lesson, or Barbaric Myth? Many of us remember learning about the story of Noah’s Ark in Sunday school. Most likely, we learned from our parents and Sunday school teachers about God’s overflowing capacity for redemption and forgiveness. Now that Hollywood is giving its take on this legendary story, let us examine exactly what moral lessons it conveys. Never before has the story been turned into s uch a lavish Hollywood spectacle. Starring Russell Crowe, Noah follows in the footsteps of efforts to lure Christians to the cinema with productions such as The Passion of the Christ and Son of God. However, the film’s producer, Darren Aronofkly, has claimed that it is “the least Biblical Biblical film ever made”. It is perhaps for this reason that religious organizations like the Religious National Broadcasters have criticized the film for straying too far from literal scripture, while secularists have criticized it for the opposite reason. But not everybody buys the argument that the Noah story represents justice, grace, and redemption. In a recent episode of Real Time, comedian Bill Maher argues, “the thing that’s really disturbing about Noah isn’t the silly—it’s that it’s immoral. It’s about a psychotic mass-murderer who gets away with it, and his name is God”. After explaining how God became enraged at humanity—even though he himself made humans flawed—Maher asks, “what kind of tyrant punishes everyone just to get back at the few he’s mad at?” He ends by suggesting that, if America is losing its values, maybe it is because American Christians “worship a guy who drowns babies”. For Maher, such a deity is neither just nor gracious. For religious thinkers, the new film as provided an opportunity to explicate the moral subtexts of the Noah story. 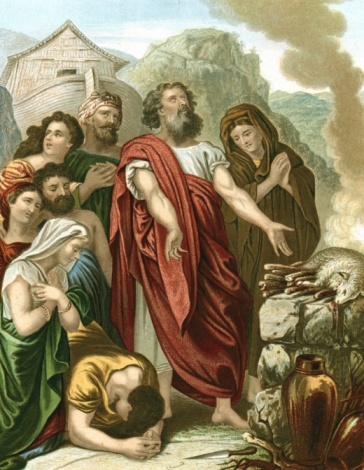 Rabbi Scott Perlo has argued the Noah story marks “the birth of universal morality, that everyone should be moral”. For him, it illustrates “how goodness survives—even after things go bad, good things can come again—” and represents the chance “in each of us to have the past wiped away and to let things come back to a place where they’re completely clean”. Meanwhile, according to Old Testament professor Carol Kaminski, “[i]t is a story of judgment against sin and a plan of redemption, and grace frames the narrative”.